Although the first modern Olympics were held in 1896, women were not allowed to compete until the 1928 Amsterdam games. Six exceptional young women represented Canada that year: Fanny Rosenfeld (1903-69) from Barrie, Jeanne Thompson (1910-76) from Penetanguishene, Myrtle Cook (1902-85) from Toronto, Florence Jane Bell (1910-98) from Toronto, Ethel Smith (1907-79) from Toronto and Ethel Catherwood (1908-87) from Saskatoon. The pinnacle event was the 4 x 100-metre relay. The team of Rosenfeld, Bell, Cook and Smith won gold with a record time of 48.4 seconds. With their medals and point count, the Canadian women scored highest overall at the Games. 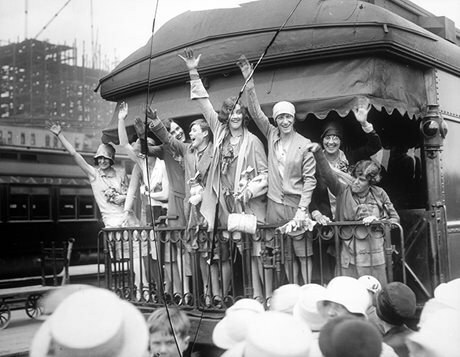 On returning to Canada, the champions were greeted by a cheering crowd of more than 200,000 at Toronto’s Union Station. They challenged previous notions of women and sport successively competing in what had previously been men-only track and field events. Learn more about Fanny Rosenfeld and the Canada’s Sports Hall of Fame female athlete of the year award named in her honour. Watch the 100-metre race from 1928 from the official Olympics website. Do you think the American Betty Robinson was actually the winner over Rosenfeld? Read more about The Matchless Six on the Canada’s Sports Hall of Fame website.